Did you think I was going to say we're moving in? no no no..silly. But every day we go to see the process and how it's coming along. And it is so hard to leave. I love being there. Love to watch the progress. I'm wondering if we should just pitch a tent? I love camping! Do you think CPS would notice? 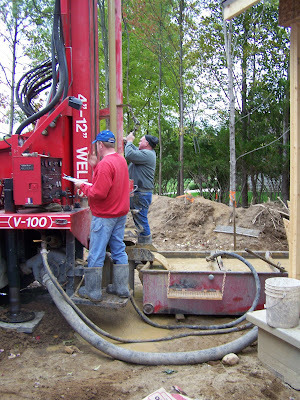 Yesterday the well was put in. What a process. 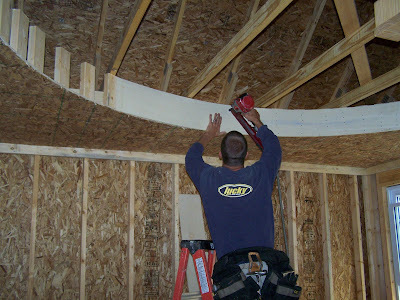 Jon who helped with the framing process...is working on a circular tray ceiling for our bedroom. He did such an awesome job of doing it just like the picture I found in a Better Homes and Gardens. Amazing. It was his first one ever he had done. The windows are now in...the framing is done and the heating and cooling were started today. Electrical and doors tomorrow. I think by the weekend we should be ready to pack it up and move over. after school Jack: "I bet since it was raining they couldn't work on the house, could they mom?" me: "yes, actually they did Jack!" Jack: "what did they do? Didn't their shoes get all muddy?" O.k. didn't make the quote of the day for the humor, just for his sweetness. Looking good!!!! I love your idea about the bedroom ceiling!!! CAN"T WAIT TO TAKE A TOUR.....someday next week maybe??!??! a few donuts added in there?!? Oh it's so good to see the progress of your beautiful house!!! I love it! I can't wait to sit in your cozy living room again:)! 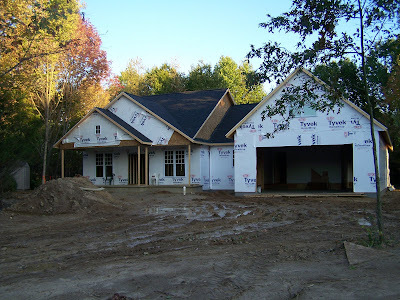 Your house is coming right along! Sweet! Jack is such a sweetie, always thinking of others! Things are lookin' great...what a beautiful setting you have to enjoy for years to come. hand me a hammer will ya?